Experience the richness of the diverse nature in Lapland. Travel with a dog sled through the deep snowy forests in Jokkmokk, over frozen lakes and mires, and west up along the river valleys toward the impressive mountains. Small and cozy timber huts will give us shelter during the nights down in the woodlands until we reach Årrenjarka half way on our journey. At Årrenjarka Mountain Lodge, owned by the Mannberg family, we will get the luxury of taking a warm shower and then enjoy a delicious dinner in the beautiful restaurant. From here our dog sled tour continues to the small mountain village Kvikkjokk, where we connect to the famous King’s Trail/Kungsleden and get two nights the Swedish Tourist Association´s comfortable mountain cabins. High above the timber line we cross the extensive mountain moors over to the river Stora Luleälvens glen and we reach our final destination, Saltoluokta Mountain Station. As always, we travel in a small group, which makes everything more personal and nice. We work as a team all together and helps with everything from fetching water, taking care of the huskies and cooking. In our dog sleds we will bring snowshoes which makes it possible to track the wild animals as wolverine, reindeer, moose, lynx, hare, ptarmigan etc. During this time of the season we have good chances to get to see the northern lights dancing over the sky in the nights. We meet and give you information about the program for the following days. Together we have a nice dinner and check the equipment. After breakfast we go by car to our husky kennel. Here we will introduce you to the dogs and give you instructions in how to handle and drive a dog team. 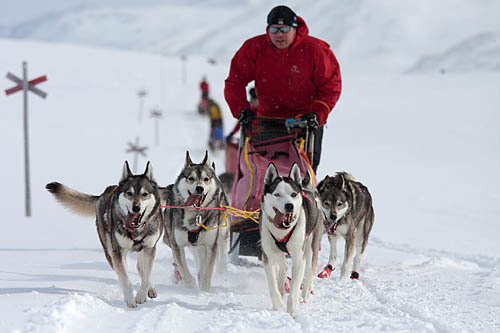 You will harness your dogs and make your sled ready for start. Our journey goes further west through the low mountains and pass the mountain Farforita that go steep down 400 m straight into the lake Karats. This day will be tougher and we travel approx. 50km. During the day we stop for lunch over an open fire. In Årrenjarka we will be serveda nice dinner and here we have the luxury with showers and sauna. King’s Trail which we will follow northward. During the following days our journey will go in the outskirts of Laponia. Laponia is listed as one of UNESCO’s World Heritage areas both for its natural and cultural values. In late afternoon we reach the cabin in Pårte just next to the border of Sarek National park. All activities are mostly moderate but sometimes hard. In wilderness cabin we sleep on bunk beds in mixed room with both gentlemen’s and women’s. The wilderness cabins are heated with wood/gas and have no electricity or running water. Dry toilet is available at the cabins. Meet us at the guesthouse Jokkmokks Åsgård at time 18:00.